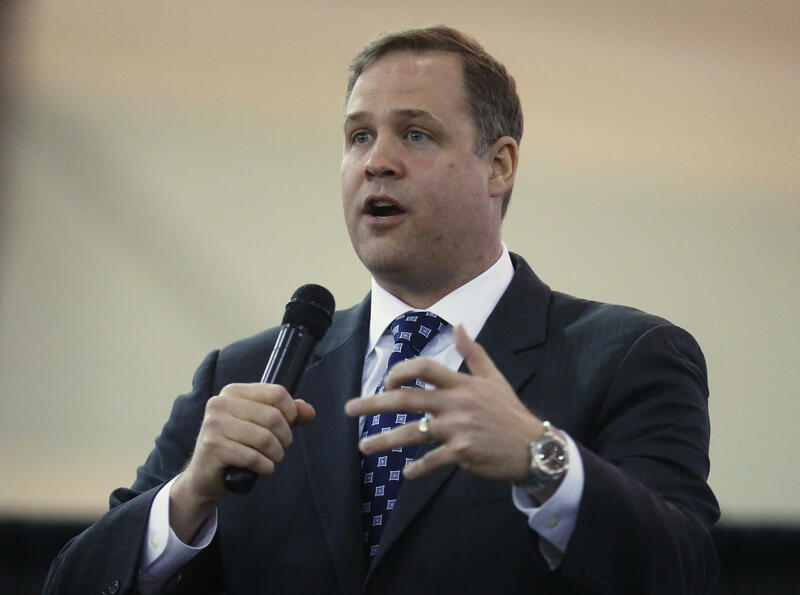 Rep. Jim Bridenstine, an Oklahoma Republican, was confirmed Thursday as NASA's 13th administrator after months of partisan wrangling over his lack of experience in the space arena and prior statements questioning human contributions to climate change. In an extremely close party-line vote, Bridenstine was confirmed 50-49, seven-and-a-half months after President Trump picked him to lead the civilian space agency. It was the most contentious nomination process in recent NASA history with most previous administrators confirmed unanimously or with little opposition. "It is an honor to be confirmed by the United States Senate to serve as NASA administrator," Bridenstine said in a statement. "I am humbled by this opportunity, and I once again thank President Donald Trump and Vice President Mike Pence for their confidence. "I look forward to working with the outstanding team at NASA to achieve the President's vision for American leadership in space." Bridenstine will take over from acting NASA Administrator Robert Lightfoot, who has been leading the civilian space agency since its previous administrator, former shuttle commander Charles Bolden, retired in the wake of the 2016 elections. Lightfoot's retirement is effective at the end of the month. As might be expected, Bridenstine supports President Trump's space policy, which calls for ending full government support of the International Space Station in 2025 and encouraging development of more commercial activity in low-Earth orbit, freeing NASA up to pursue a return to the moon and eventual piloted missions to Mars. "I've been talking to Jim, and I know he's eager to begin leading this team," said Lightfoot. "He joins our great agency at a time when we are poised to accomplish historic milestones across the full spectrum of our work. "I know first-hand how talented and dedicated our workforce is, and that all of you stand ready to work with our new administrator to accomplish our exciting goals, including returning Americans to the moon." A former Navy combat pilot, Bridenstine was elected to represent Oklahoma's first congressional district in 2012, serving on the House Armed Services Committee and the Science, Space and Technology Committee. He accumulated 1,900 hours flying time and 333 carrier landings flying E-2C Hawkeyes and, later, F-18 Hornets before leaving active duty to serve as executive director of the Tulsa Air and Space Museum & Planetarium. He majored in economics psychology and business at Rice University and holds an MBA from Cornell University. He is the first politician to be named NASA administrator and his lack of professional space experience and technical education prompted strong criticism from Democrats, including Sen. Bill Nelson, D-Florida, who has long worked on space-related issues and who flew in orbit aboard the shuttle Columbia as a guest astronaut in January 1986. "The NASA administrator should be a consummate space professional ... not a politician," Nelson said earlier this week. "More importantly, the administrator must be a leader who has the ability to bring us together to unite scientists and engineers and commercial space interests and policymakers and the public on a shared vision for future space exploration." Nelson described Bridenstine's congressional behavior as "divisive as any in Washington," and said the nominee was "not prepared to be the last in line to make that fateful decision on go or no-go for launch." During Bridenstine's confirmation hearing, critics also challenged past comments about climate change. In a 2016 interview with Aerospace America, he questioned human contributions to climate change, saying "it has always changed." "There were periods of time long before the internal combustion engine when the Earth was much warmer than it is today," he said. "Going back to the 1600s, we have had mini ice ages from then to now." "That's why we need to continue studying it," he said when asked if humans might, in fact, be playing a role. "Again, I am not opposed to studying it. What you'll find though is that the space-based assets that are studying climate change are not in agreement with the terrestrial assets that are studying climate change." Many experts disagree with that assertion and during his confirmation hearing, Bridenstine said he believes human activity contributes to the buildup of greenhouse gases but would not say how significant that contribution might be. He did, however, promised that "science would drive the mission at NASA," Politico reported. "Should I be confirmed, it will be my intention to build off the work done by the great people at NASA during the last administration," he said. "We must all do this together." The Commercial Spaceflight Federation applauded the confirmation, saying in a statement that "NASA needs dedicated and inspired leadership, and Representative Bridenstine is an outstanding choice to provide precisely that." The Coalition for Deep Space Exploration agreed. President and CEO Mary Lynne Dittmar said the "coalition and its member companies stand ready to support Administrator Bridenstine as we take the next steps in the exploration of deep space, returning to the Moon and going on to Mars.